Kilauea is one of the five major volcanos that form the Big Island or Hawai'i. It is located within the Hawaii Volcanoes National Park. Since 1983 it has been continuously erupting lava. 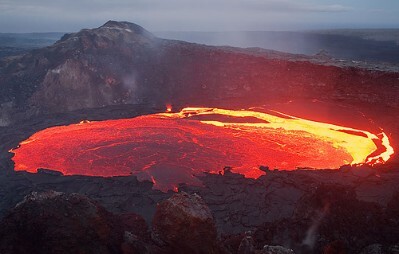 Although explosive eruptions have happened, the volcano is not very violent. It is a great place for volcanologists and tourists to study a volcano at close range. Every year Kilauea is visited by millions of tourists, and It is the most visited attraction in Hawaii and the most visited volcano in the world.